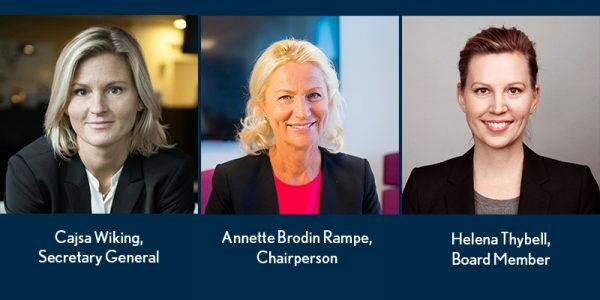 Global Child Forum, the children’s rights and business organization, is pleased to announce the appointment of Cajsa Wiking as Secretary General, Annette Brodin Rampe as Chairperson of the Board of Directors and Helena Thybell as a new Member of the Board. The additions contribute to building on the organization’s solid foundation by providing strong leadership and shaping Global Child Forum’s priorities. Global Child Forum brings together thought leaders and influencers from business, civil society, academia and government to spur action for social change around children’s rights with a particular focus on the power of business to drive that change. Since the organization’s beginnings, ten forums have been held in various regions in the world. Cajsa Wiking has a long track record from both the business and non-profit sectors. For the past five years, she has held the position as Executive Director for Operation Smile Sweden, significantly growing the organization’s resources and capabilities. Cajsa brings to Global Child Forum her extensive experience and knowledge regarding children’s rights from her work at UNICEF and at Plan Sverige. From her years working at SEB and Skandia, Cajsa has a deep understanding for the challenges and opportunities facing business today. Cajsa Wiking assumes her role as of January 2019. Annette Brodin Rampe currently serves as CEO for Internationella Engelska Skolan. She brings to Global Child Forum her wealth of leadership experience, including at multinationals such as Brunswick Group, where she served as Managing Partner Europe. She has over 20 years of successful board level experience in Nordic companies among others Norske Skog, Vattenfall and Peab. She is also board member of Ferronordic Machines AB and board member for the Swedish-British Chamber of Commerce. In her new role as Board Chairperson, Annette Brodin Rampe will focus on refining the organization’s strategy by consolidating and advancing regional efforts and building on the Forum’s solid foundation. Helena Thybell joins Global Child Forum’s Board of Directors bringing with her an extensive background in sustainability, global development and human resource issues. She is currently Head of Global HR for H&M group. Prior to this position, Helena Thybell was the Global Manager of H&M Foundation. Helena has also worked as the General Manager of the Swedish Postcode Foundation, as well as a Regional Coordinator for the Swedish Red Cross and Secretary General of the Swedish Red Cross Youth Society, managing overall child and youth issues in Sweden.